President Trump signed the NASA Transition Authorization Act of 2017 on March 21, surrounded by members of congress. Two NASA astronauts in attendance presented Trump with an astronaut flight jacket. President Donald Trump has signed the NASA Transition Authorization Act of 2017, which sets a $19.5 billion budget for the agency for fiscal year 2017. The bill — S.442 — is the first NASA authorization bill to reach a U.S. president's desk since 2010. Trump signed the bill into law today (March 21) during a televised ceremony in the Oval Office. He was joined by NASA astronauts Tracy Caldwell Dyson and Chris Cassidy, who presented the commander in chief with a NASA flight jacket. "With this legislation, we support NASA's scientists, engineers, astronauts and their pursuit of discoveries," Trump said during the signing event. "This bill will make sure that NASA's most important and effective programs are sustained. It orders NASA to continue … transitioning activities to the commercial sector where we have seen great progress … It continues support for the Commercial Crew Program, which will carry American astronauts into space from American soil once again. It's been a long time." Also attending the signing were Sens. Marco Rubio and Bill Nelson, both of Florida, home to NASA's Kennedy Space Center; Sen. Ted Cruz of Texas, home to NASA's Johnson Space Flight Center in Houston; and Rep. Lamar Smith, also of Texas, chairman of the House Committee on Science, Space, and Technology. The legislation accomplishes a long-discussed goal of providing lifetime health care coverage for retired astronauts. That coverage will also help NASA monitor the long-term effects of spaceflight on humans. NASA's new heavy-lift rocket, called the Space Launch System (SLS), and the Orion human spaceflight capsule both received sustained support in the new legislation. Orion could be used to carry astronauts to the moon or to help ferry them to deep-space destinations, and the new law also calls on the agency to investigate whether the spacecraft could be used to ferry humans to the International Space Station. Under the new law, NASA will continue its efforts to eventually send humans to Mars, and the legislation "amends current law by adding human exploration of Mars as one of the goals and objectives of NASA and directs NASA to manage human space flight programs to enable humans to explore Mars and other destinations," according to a statement from Cruz. "It puts us on the dual track," Nelson said of the new law. "We have the commercial companies going to and from the International Space Station, and we have NASA going out and exploring the heavens. And we're going to Mars." In addition, the new legislation calls for "maximizing utilization of the International Space Station (ISS)," according to the statement on Cruz's website, and it maintains support for NASA's contracting of commercial companies to send crew and cargo to the ISS. NASA will continue to support the ISS at its current funding level through 2024, but the act also "requires NASA to submit a report to Congress outlining a plan to facilitate a transformation of operations in low-Earth orbit from a model largely reliant on government support to one reflecting a more commercially viable future." Following the President's signing of the law, NASA's acting Administrator Robert Lightfoot released a statement via the agency website. "We would like to thank President Trump for his support of the agency in signing the National Aeronautics and Space Administration Transition Authorization Act of 2017," Lightfoot said. "We also want to express our gratitude to a bipartisan Congress for its thoughtful consideration of the agency’s path forward. We are grateful for the longstanding support and trust of the American people, which enables our nation’s space, aeronautics, science, and technology development programs to thrive." "Our workforce has proven time and again that it can meet any challenge, and the continuing support for NASA ensures our nation’s space program will remain the world’s leader in pioneering new frontiers in exploration, innovation, and scientific achievement," Lightfoot said in the statement. 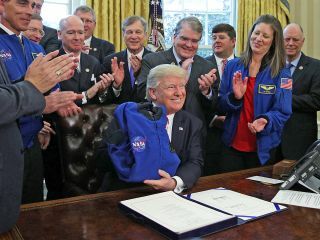 President Trump signed the NASA Transition Authorization Act of 2017 on March 21, 2017, surrounded by members of Congress and two NASA astronauts. The bill was originally introduced in the U.S. Senate by Sens. Cruz; Nelson; Rubio; Gary Peters, D-Mich.; John Thune, R-S.D. ; Tom Udall, D-N.M.; Patty Murray, D-Wash.; and John Cornyn, R-Texas, according to Inside Outer Space. In the House, the committees with jurisdiction over the bill are the House Committee on Science, Space, and Technology; and the House Subcommittee on Space, chaired by Rep. Brian Babin, R-Texas. Trump's proposed NASA budget for fiscal year 2018, which is not part of the recently enacted legislation and is still only a proposal, would reduce the agency's funding to $19.1 billion, and would likely cancel the Asteroid Redirect Mission and reduce the agency's Earth Science Division budget by $102 million. Editor's note: This article previously stated that Johnson Space Center is home to NASA headquarters; the agency's headquarters is in fact in Washington D.C. This article was updated March 21 at 5:15 p.m. EDT to include comments from NASA's acting Administrator Robert Lightfoot.